First thing first, I would like to clarify one commonly made assumption about leadership. Leadership is not something you find only at the highest levels of organizations and society, you can find leadership in all spheres of life. Secondly, I think its critically important to determine how you as an individual tend to approach problems in everyday life. For example, is your response to life's day to day problems characterized by a sense of complacency (the thought or feeling that there is no need for a change in you or others behaviors)? This complacent attitude says, 'if it aint broke, why fix it'. These individuals usually have a history of succeeding and hence have no need to look outward for possible opportunities or threats. They think and feel that nothing is wrong. Or perhaps you are an individual that approaches life's challenges with what Kotter calls 'a false sense of urgency'. This method of problem solving is characterized by frenetic activity that essentially gets nothing done. A false sense of urgency is usually rooted in some sort of past failure. These individuals tend to be frustrated or angry at life's failures and hence they walk around engaging in all sorts of activity to show that they are doing something, but in reality they are not actually doing anything that produces real results. Lastly, there is the approach that Kotter's book recommends. In his text, the author suggests that people adopt what 'a true sense of urgency'. This true sense of urgency is a highly positive and a highly focused force that gets things on a day in, day out basis. This method of problem solving rarely, if ever, leads to a race to "deal with the trivial, to pursue pet projects of minor significance to the larger organization". This approach is marked by a gut-level determination to get results today, not tomorrow. A true sense of urgency is not concerned with whining or complaining about the past. People with a true sense of urgency actively look for opportunities to produce change and get results each and every day. 1. Bring outside reality into groups that are too inwardly focused by creating stories and emotionally compelling experiences. 2. Behave with true urgency every single day by clearing your calendar to make time for your particular change initiative. 3. Look for the upside possibilities in crises, seeing a threat as a potential opportunity to destabilize an overly stable organization. 4. Confront the NoNos (i.e. those individuals that enjoy destroying true urgency). 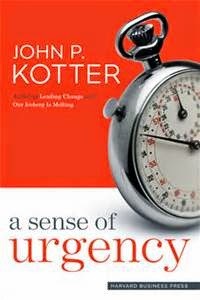 Don't put up with people who relentlessly kill urgency, whose reaction to any new idea is "no, no you see..."
Kotter goes on to suggest that the most important enemy of true urgency is a crowded appointment calendar. "When you are going from one meeting to the next, all on different topics, all run inefficiently, attitudes and feelings about urgency drain out through sheer exhaustion. Clutter undermines true urgency. Fatigue undermines true urgency." 1. Purge and delegate- Remove low priority tasks from your calendar books or blackberry's. See if someone else can take care of these tasks for you. This can free up your time to take care of high priority affairs. 2. Move with speed and purpose- Know where you are going, stay disciplined. Maintain your focus. 3. Speak and act with passion- Articulate your vision and values in a compelling manner each and every day. 4. Match words and deeds (walking the talk)- Do what you say, model the way for others. ANWAR'S REFLECTIONS, Trenton, NJ. 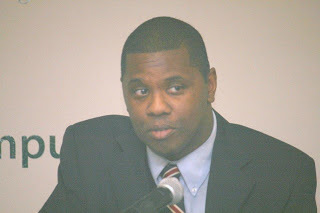 Anwar G. Salandy. anwarsalandy@ymail.com. Simple theme. Powered by Blogger.